JUMIA being the largest online shopping community in Tanzania is partnering with NYAMA CHOMA Festival for the upcoming September event in Dar es salaam, allowing customers to purchase their tickets using their online platform. As JUMIA continues to expand in providing customer needs and services, the world of social entertainment is not an exception for them. NYAMA CHOMA festival is the largest Barbecue showcase festival in East Africa. A social event that brings together people from all walks of life. The festival aims to provide more social interaction amongst people, more networking, but above all keep our tradition of having Nyama Choma as the main entree in East Africa. ‘We think about what people may need both occasionally or on a daily basis and try to find the best yet simple internet solution to cater for those needs using our platform.’ says the Marketing Manager for JUMIA- Tanzania, Harrieth Mgongolwa. ‘It’s time saving as it takes less time to purchase a ticket online than it does at a retail outlet. Accessible anytime for the buyer to purchase and provides a solution to ticket forgery a common problem that a lot of event planners tend to face’ adds on the Marketing Manager for JUMIA- Tanzania. 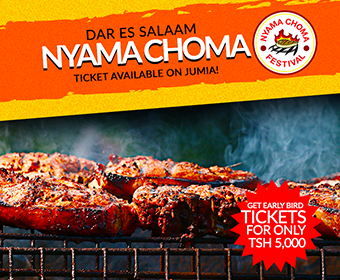 NYAMA CHOMA early bird tickets for the September 3 RD festival in Dar es Salaam will be available for a limited period of time on JUMIA from 15 th August, 2016 for the price of Tsh 5,000 (a 50% discount). Visit their website www.jumia.co.tz to purchase your ticket and pay using mobile money options of Tigo Pesa, Airtel Money and M-Pesa.